Our Bright 36" Traffic Cones are flow molded with fluorescent orange over a white inner layer to produce a brilliant orange color for high visibility. UV stabilizers in the PVC reduce fading for a long product life. Each traffic cone is fused to a wide skid resistant base with stabilizing feet made from a heavier material to lower the cones center of gravity and increase its stability. Would you like to save time on your worksite? Our cones stay in place so the need to reset them is reduced. In addition to skid resistance, the clever base design prevents the cones from sticking together making cone deployment fast and easy. Our cones meet all Federal requirements and are made in the USA from 100% PVC. 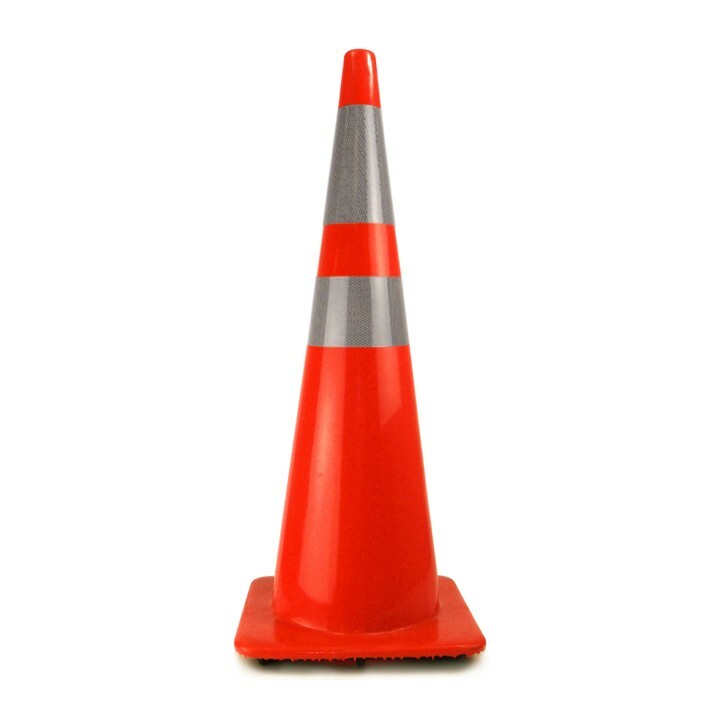 Our already bright traffic cones are enhanced with 3M Series 3840 High Intensity Cone collars. Retro reflective sheeting takes the light from oncoming vehicle headlights and redirects it back towards the driver, making the cone appear to glow in the dark. Combined with the already bright, dual layer surface, you are getting a cone that is impossible to miss.